For now let's look at the JWSSignatureTest. These tests mostly follow the same basic format. The web service configuration defines a number of endpoints that map to the same web service implementation (a simple DoubleItService, which allows a user to POST a number and receive the doubled amount, where both the request and response are encoded via JSON). The client test code uses the CXF WebClient API to sign the message payload by adding a specific provider. The message in turn is validated by a provider on the receiving side. You can run the test via the command line "mvn test -Dtest=JWSSignatureTest", and the message requests and responses will appear in the console. For example, here is the output of the "testSignatureCompact" request. The Payload consists of the concatenated (+ separated by a '.') BASE-64 URL encoded JWS header (e.g. containing the signature algorithm, amongst other values), the BASE-64 URL encoded message payload, and the BASE-64 URL encoded signature value. As well as adding the desired providers, it is also necessary to specify the security configuration to set the appropriate algorithms, keys, etc. to use. The CXF wiki has an extensive list of all of the different security configuration properties. For signature, we need to first load the signing key (either a JKS keystore or else a JSON Web Key (JWK) is supported). As well as defining a signing key, we also need to configure the signing algorithm. The list of acceptable signing algorithms for JWS is defined by the JSON Web Algorithms (JWA) spec. For signature, this boils down to a public key signature scheme based on either RSA or EC-DSA, or a symmetric scheme using HMAC. The service side configuration is largely the same, apart from the fact that we don't need to specify the "rs.security.key.password" configuration tag, as we don't need to load the private key. The signature algorithm must be specified to impose a constraint on the acceptable signature algorithm. The JWS payload (the content to be signed) can be any binary content and not just a JSON Object. This means that we can use JWS to sign an XML message. This is a really cool feature of the specification in my opinion, as it essentially removes the need to use XML Signature to sign XML payload. An example of this is included in the JWSSignatureTest. The configuration is exactly the same as for the JSON case. rs.security.signature.include.public.key - Include the JWK public key for signature in the "jwk" header. rs.security.signature.include.cert - Include the X.509 certificate for signature in the "x5c" header. rs.security.signature.include.key.id - Include the JWK key id for signature in the "kid" header. rs.security.signature.include.cert.sha1- Include the X.509 certificate SHA-1 digest for signature in the "x5t" header. One advantage of including the entire certificate is that the service doesn't need to store the client certificate locally, but only the issuing certificate. A new security advisory has been released for Apache CXF, which is fixed in the 3.1.3, 3.0.7 and 2.7.18 releases. Apache CXF supports the SAML SSO protocol with JAX-RS web service endpoints. It is possible for a malicious user to construct a SAML Response (the response from the SAML SSO IdP to the endpoint) via a so-called "wrapping attack", to allow that user to log in instead of the authenticated user associated with the signed SAML Assertion. Please see the Apache CXF security advisories page for more information. 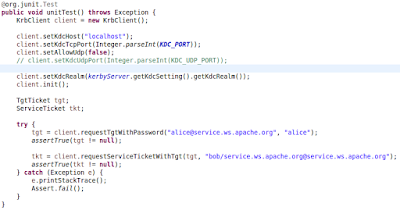 The previous blog post described how to use Apache Directory to easily create a KDC via Java annotations for kerberos integration testing. 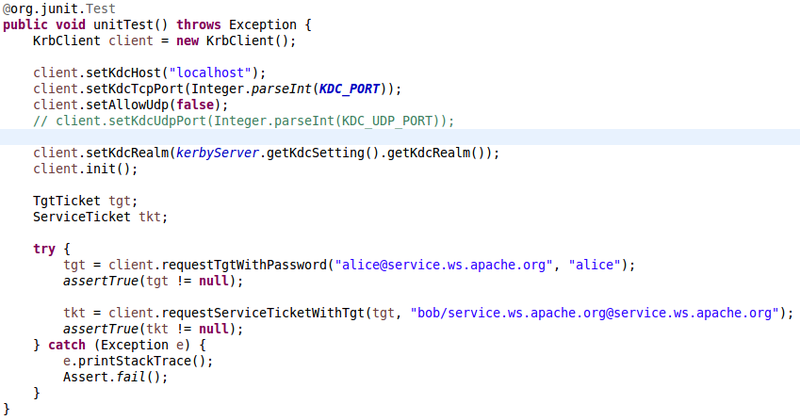 In this post, we will look at an alternative way of setting up a KDC for integration testing using Apache Kerby. Apache Kerby is a new subproject of Apache Directory that aims to provide a complete Kerberos solution in Java. Version 1.0.0-RC1 has recently been released and is available for testing. Apache Kerby consists of both a KDC as well as a client API, that is completely independent of the GSS API that comes with Java. A key selling point of Apache Kerby is that it is very easy and fast to setup and deploy a KDC. It is possible to set up a KDC completely in code, without having to edit any configuration files or configure any system properties. cxf-kerberos-kerby: This project contains a number of tests that show how to use Kerberos with Apache CXF, where the KDC used in the tests is based on Apache Kerby. Have fun playing around with Apache Kerby and please join and contribute to the project if you are interested!